In the rarified world of Passivhaus design there has been a small problem gnawing away at many enthusiasts, especially the selfbuilders. Wood stoves. They may not need them, but they want them. Focal point fires. Comfort. Neolithic TV. Call it what you will, but fires have a certain pull. And a pellet boiler just won't do. There are — or have been — a couple of problems. One is that you need so little heat in a Passivhaus that the smallest wood stove is still too big. It's hard to make a wood stove that doesn't emit at least 4kW of heat, because that's what a log gives off when it's burning well and it seems a bit pointless to start burning kindling. That's not too big an issue — after all, as Passivhaus devotees keep saying, you can always open a window to make the room a bit cooler if you get too hot. Or you can start using the stove to heat hot water — but maybe not, as here things start to get a little bit more complex. The next issue is the fresh air supply. Opening that same window is not really an acceptable failsafe option. And you can't fall back on the traditional, permanently open, ventilation grill — not when you've gone to so much trouble to make the place so airtight in the first place. In a draughty old pile, it's not really a problem because there is plenty of fresh air coming at you from all corners, but in a Passivhaus that's not the case. The supply air problem is usually addressed via an air duct piped directly into the stove. It's still not ideal, as it creates a cold bridge with the outside and another potential air leakage path — remember, all penetrations are bad news. But it's sort of on the right lines. It makes the stove room-sealed. But another niggly little issue concerns spillage, the term given to the cloud of smoke emitted from the stove every time you open the door to re-load. In a draughty old pile, it quickly gets lost in the background, but in a Passivhaus the smoke will hang around until it's drawn away into the MVHR system, where it will end up clogging up the filter. has been beavering away in his Whitstable workshop and has hit on a spillage-free design. 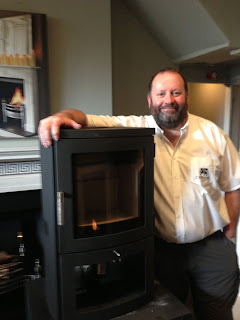 "Until now, the best solution on the market has been a stove with a hinged door with an automatic closer," he told me. "We've come up with a design which diverts the air intake when the door opens so that the supply flow is redirected from an opening under the door into the stove, and away up the flue. It doesn't smoke at all"
The idea for a Passiv stove came about when they were contacted by CenterParcs with a view to supplying stoves in all their Passivhaus-standard chalets at their yet-to-be constructed Woburn site. 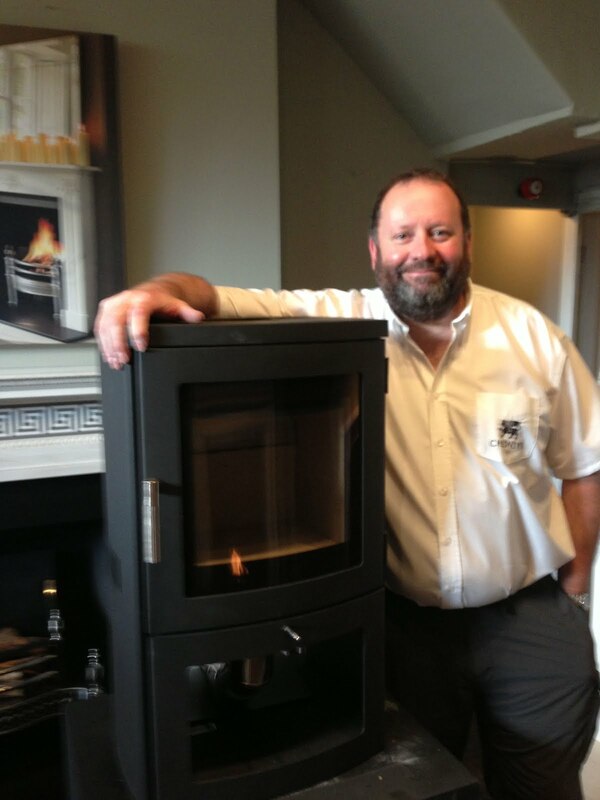 The contract itself came to nothing, as CenterParcs later lowered their spec on cost grounds, but Chesney's carried on with the project and have now launched the resultant stove commercially. Its been through rigorous testing at Gastec in Cheltenham (the place where all UK good wood stoves get tested for smoke emissions) and has emerged with distinction. Both carbon monoxide and carbon dioxide emissions were rated as "negligible" even when subjected to worse case scenarios — i.e. forgetting to close the door. At present, the new design has been fitted into a fairly basic 4.6kW Milan stove. It's being marketed under the name of Milan Passiv and the retail cost will be around £1150 plus VAT, which is around 25% more than the regular Milan stove. This puts it down at the lower end of what people pay for new wood burners. As it happens, Passivhaus stove enthusiasts may have another promising development on the horizon. Poujoulat, the French chimney and flue manufacturers, are about to launch a triple-walled stainless steel flue which will work in conjunction with Chesneys new stove range. The advantage of a triple-walled flue is that the external cavity becomes the the stove intake air supply, in a the way a balanced flue works on a gas boiler. Not only does the intake air get pre-heated as it's drawn down the flue (thus increasing combustion efficiency), but the extra vent hole for supply air is eliminated. Instead of two penetrations, you have one: music to the ears of Passivhaus builders. I spent Tuesday at the NEC in Birmingham, visiting an exhibition entitled RetroExpo. Running inside it was a Green Deal Summit which featured a number of Green Deal(GD) notables working through their PowerPoints. That's not to be disparaging about them, there were lots of very distinguished speakers, and the exhibition is to be congratulated for assembling them all together in one place. Surely, now was the chance to learn something significant about GD? Well maybe, maybe not. I've yet to write anything enthusiastic about GD and my feelings haven't changed much as a result of Tuesday's deliberations. For a start, it's damned complicated, so complicated that presenters kept flashing up organisation charts only to quickly withdraw them because they were too difficult to explain. Not encouraging. It seems to get a GD going, you have to start with an assessor coming to visit your property and carrying out a survey. How much will this cost? Various answers from £130 down to nothing. If it's nothing, that tends to suggest that the assessor will be a tied agent. Would you trust such a person to carry out an independent survey? I wouldn't. Anyway, stage two is to put the survey results into effect. There is much talk of the Golden Rule which means that the works to be undertaken have to payback in 10 years. Or is it 25? Or something else? I'm afraid I still don't know. And do you have to take the GD Finance Deal (at somewhere between 6% and 8% APR — again no one can say for sure)? What if you decide to arrange your own finance, or just pay for it from savings, is it still a green deal, and will you get the guarantee? No one could answer these either. How much will it all cost? It was here that I did learn something new although it still didn't fill me with confidence. The government has announced some kick start money to get the GD off the ground. I though this was just window dressing, but it turns out this may just be the start and that the energy companies will soon start to subsidise GD works in the way they have been doing cavity wall and loft insulation. They are required by law to undertake carbon saving measures, expressed in tonnes of carbon per annum (it's different for each company, depending on their size). Some of this carbon-saving cash is probably going to filter through to GD providers and it may end up subsidising works such as external wall insulation (EWI), which on their own are very unlikely to ever meet the Golden Rule. So, for instance, if EWI is estimated to cost £10,000, and the expected saving is, say, £300/annum, then the householder might only have to pay £3,000 (which gets roughly a 10 year payback), with the other £7,000 being paid for via an energy company subsidy - or ECO as it's getting called. Or at least I think that's what ECO is — once again the slippery nature of the GD makes it hard to know what is what. Was ECO a fund or a mechanism? Or both? If I am right, then you really need someone else acting as a broker, who could fit your job together with the appropriate energy company, the one who is offering the best subsidy for this kind of work. At least, I think that may be how it will work. I could also be completely wrong. But then, if I am, I will not be alone. b) how much I didn't understand — like how is it all going to work. I wish it well, but I don't think the runes are looking too helpful.